Cold Stone Creamery Candy Cone Creations: I enjoyed this one. It is exactly what it says on the wrapper: it's a huge chunk of decent milk chocolate crammed into a cone. It's like the very bottom of a Nutty Buddy (the good kind, not the knockoffs) where there's a cold chunk of solid chocolate at the bottom. Only this is the whole cone and it's not cold (although, I guess, it could be if you planned). As someone who will eat 90% of a Nutty Buddy just for that little chunk at the end, this gets a thumbs up for me. 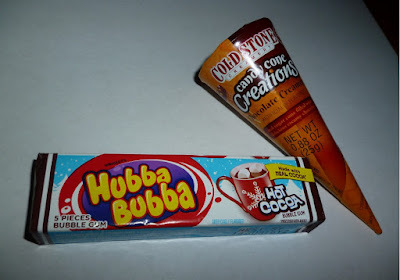 Hubba Bubba Hot Cocoa gum: First off, I was unaware Hubba Bubba still was in business. I assume it was purchased by Nestle decades ago and queity buried in the back yard after I turned, like 12. Anyway, hot cocoa bubble gum is pretty good. Too good, in fact, because I kept wanting to swallow it. It tastes too much like actual chocolate to be gum, which is a weird thing to say and even weird to chew. So give it a try but be forwarned: you don't want that wad of gum in your stomach for the next seventeen years! I have not yet tried any confectionary products from any of these confectionery manufacturers. These goodies seems tempting especially the candy cone. I will surely try this one out soon.